Replace with a genuine Honda pump. Replace with an aftermarket pump. 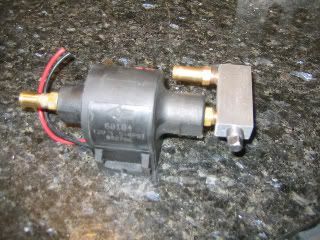 The pump utilises a pair of contact breakers, so repair can be a case of replacing the contact breaker, but while this is the most common failure it isn't always the case and the failure is within the pump body which means replacing the breaker points still leaves the owner with a non-functioning fuel pump which has to be replaced (i.e. time and money wasted). Prices do vary so shop around, but typically, these are available from just over £20 to £35 and replacement is fairly straightforward for a competent home mechanic. There is a "how to" video on the link below to Wemoto for those that need a bit of a guide, and you will need a soldering iron to complete the job. Other than that it's just basic tools and common sense. Click here 1998-2001 NT650V Deauville fuel pump contacts from Wemoto. If you don't have a 1998-2001 NT650V Deauville, but still need parts then click this next link to Wemeoto and enter your bike make/model in "FIND YOUR BIKE" and follow the links. This site is well sorted and works well, but, prices can be on the steep side depending on what you are after. They cover all Deauvilles and most Hondas often with a choice of genuine or pattern parts. Click here for Wemoto home page. As you'd expect, this is both the easiest and most expensive solution. The genuine Honda fuel pump is horrendously expensive from your local Honda dealer, and it's from £135 + VAT from Honda parts specialist David Silver Spares (and there's P&P on top of that price). For more details follow the link below. Click here 1998-2001 NT650V Deauville fuel pump from David Silver Spares. 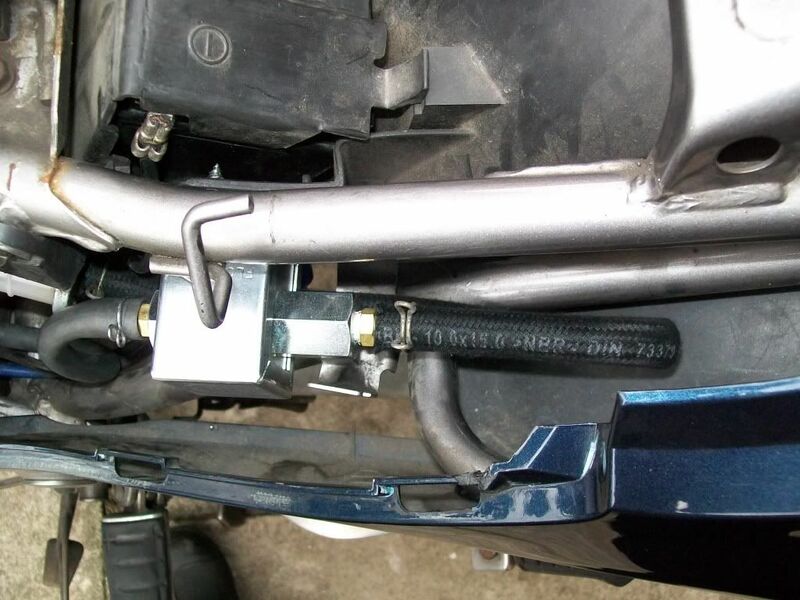 Firstly, my solution for which I used the most commonly used and recommended replacement for the standard Honda fuel pump which is produced by Facet and the whole job was done with just basic tools and a sharp Stanley knife. 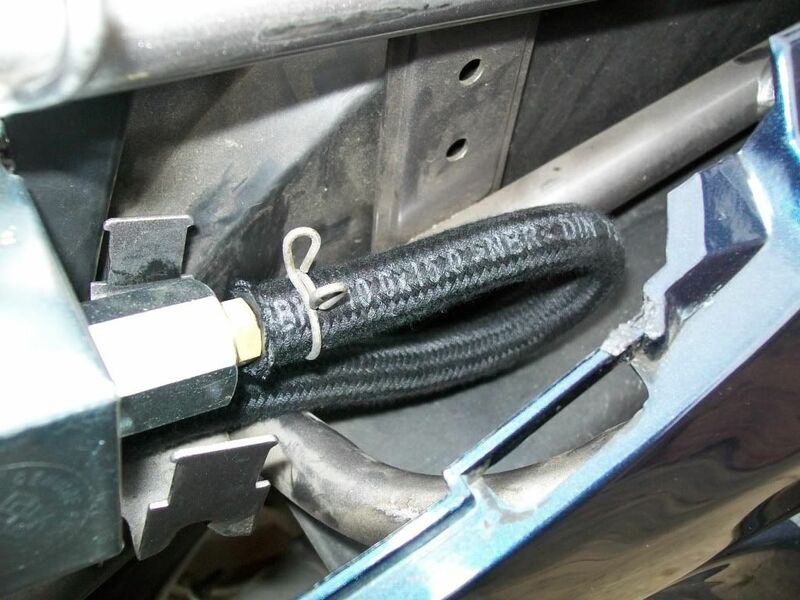 Please note that two different Facet pumps are used in the following articles, both work fine and both of these Replace - Aftermarket solutions are the choices of the bikes' owners. 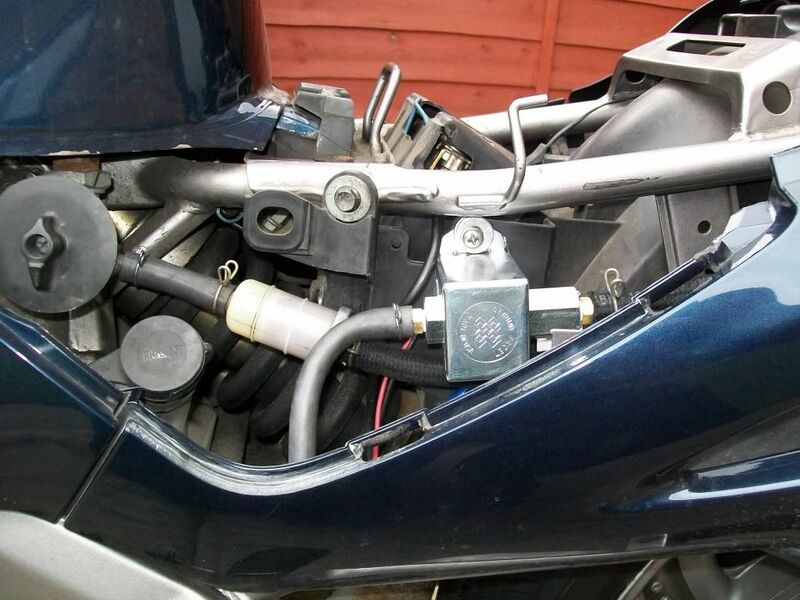 The advantage of the Facet pumps over the standard Honda pump is that it is fully transistorised with no cotact breakers or other parts to fail and should last the lifetime of the bike. It is also more cost effective (i.e. cheaper) and the solution I utilised cost roughly £45 (internet order, delivered to home) and took me about an hour to do from start to finish. 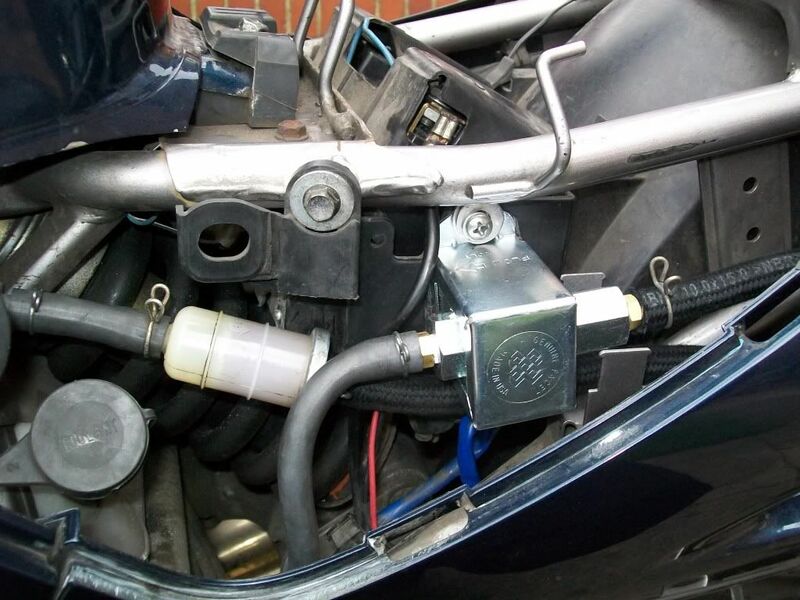 Which I bought from Fuel Pumps Online Temple Tuning - follow the Facet fuel pumps link. 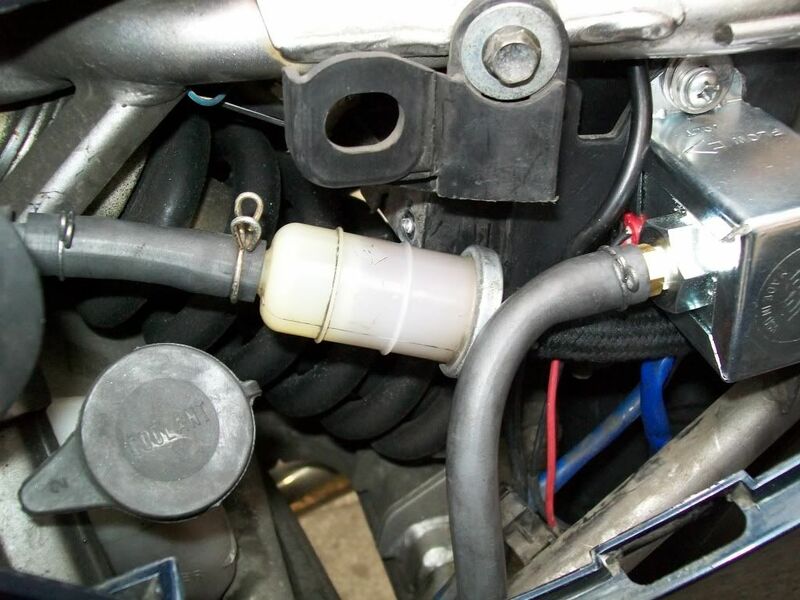 Viewed from above, fuel filter and pump visible below the frame tube. Then viewed from the side, looking back, showing fuel line routing. A close up of the Facet 40104 fuel pump, new and old fuel lines. On the right, just visible the removal of the filter mounting bracket. Fuel pipe comes in under the new pump and curves round and back up into the pump. Single self tapping screw into battery box. 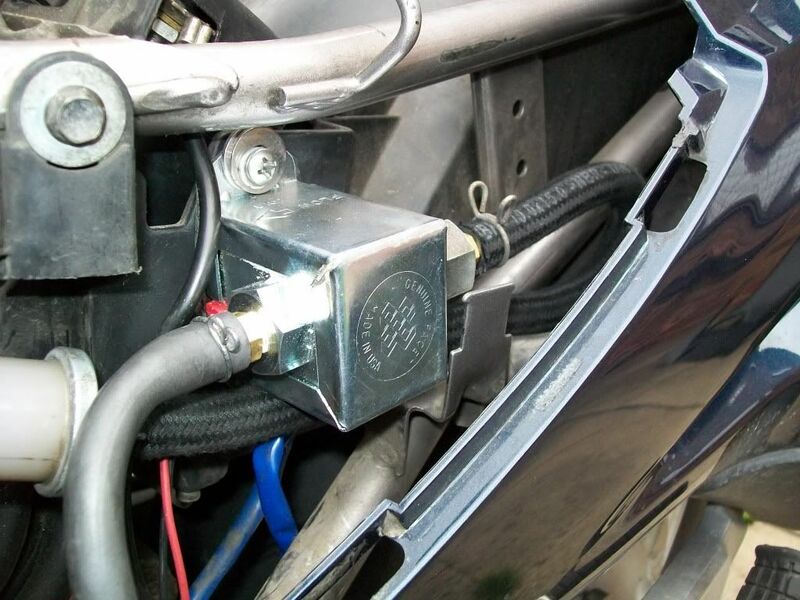 Fuel pump is mounted using double sided tape to the side of the battery box. Original fuel pipe from pump to engine. The new fuel pipe is a bit long and could be shortened. 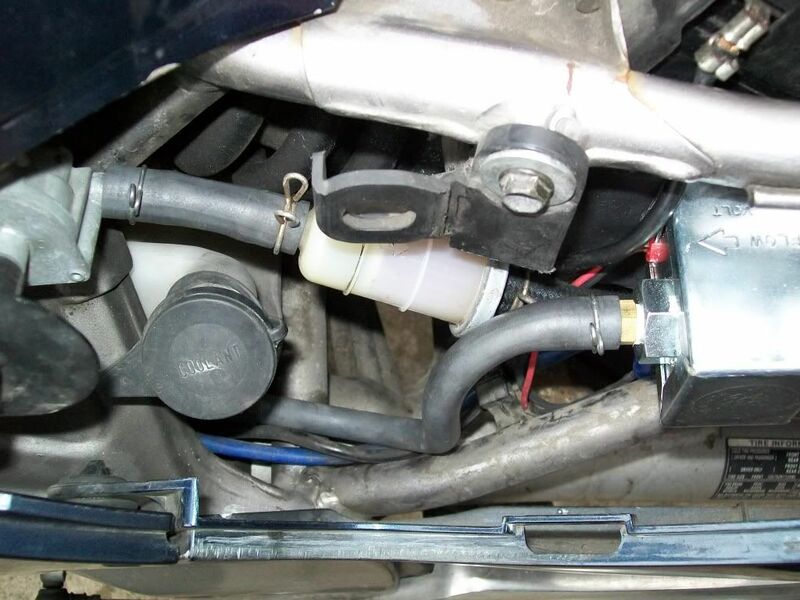 Fuel filter is no longer mounted on any bracket, now free floating. The 10mm adaptors used were ordered with the pump and screwed in using PTFE tape for a reliable seal. With all plastics and the seat put back in place the new pump can be faintly but clearly heard when the engine is running. Like I said earlier, the whole job was done with just basic tools and a sharp Stanley knife. If I can do it then just about anybody else can do it. The following write up was produced by Deauville owner Brian Vigures, based on his personal experiances which he documented on the UK Deauville owners forum. 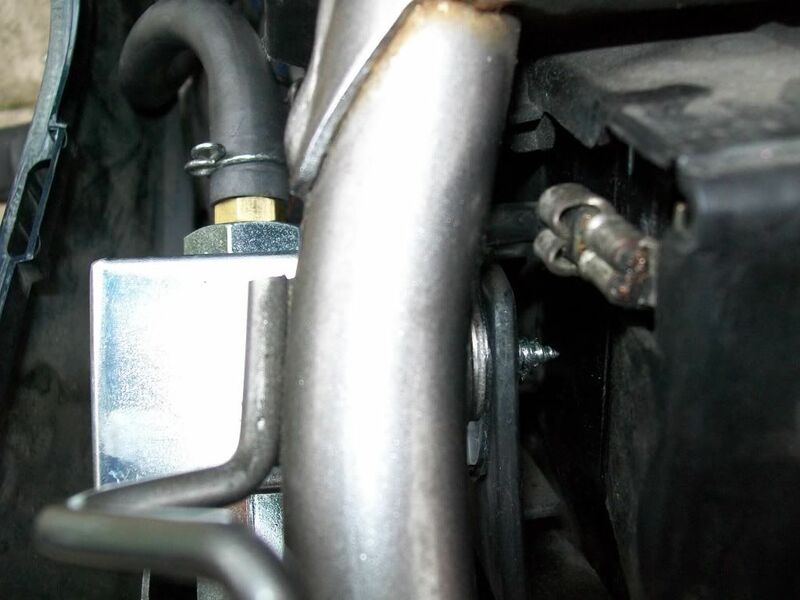 In order to bring both ports to point in the right direction, I made a simple manifold out of a block of aluminium, easily accomplished with hand tools and drill (remember, Brian is an engineer by occupation). 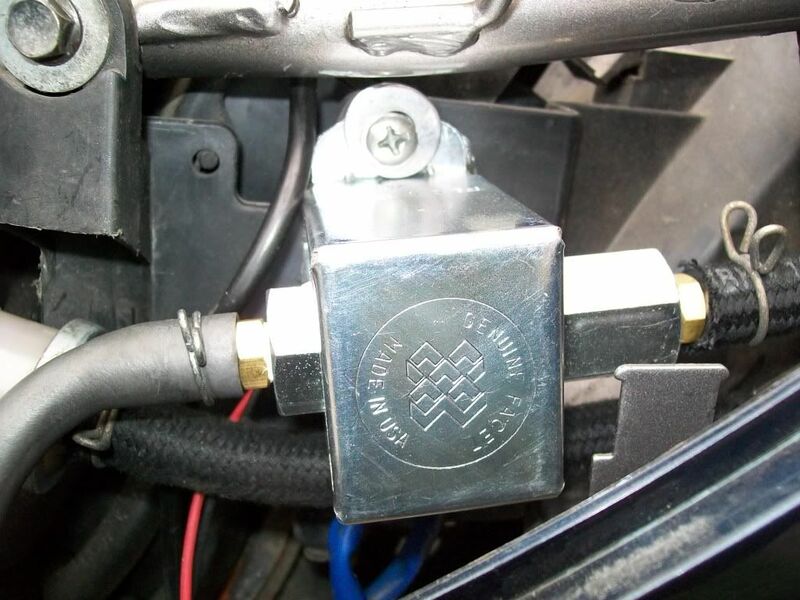 Above - Brian's design for the Facet fuel pump manifold. Measurements in millimetres. 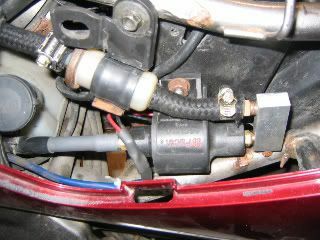 The manifold attached to the pump inlet port with a male / male 1/8 tapered BSP straight connector. Available from most pneumatic suppliers. 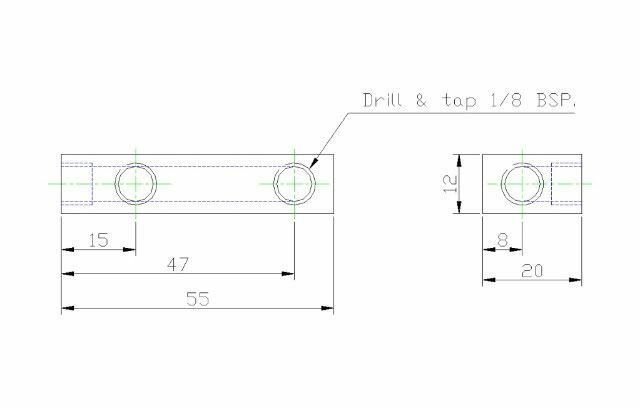 The plug blanks the drilling. 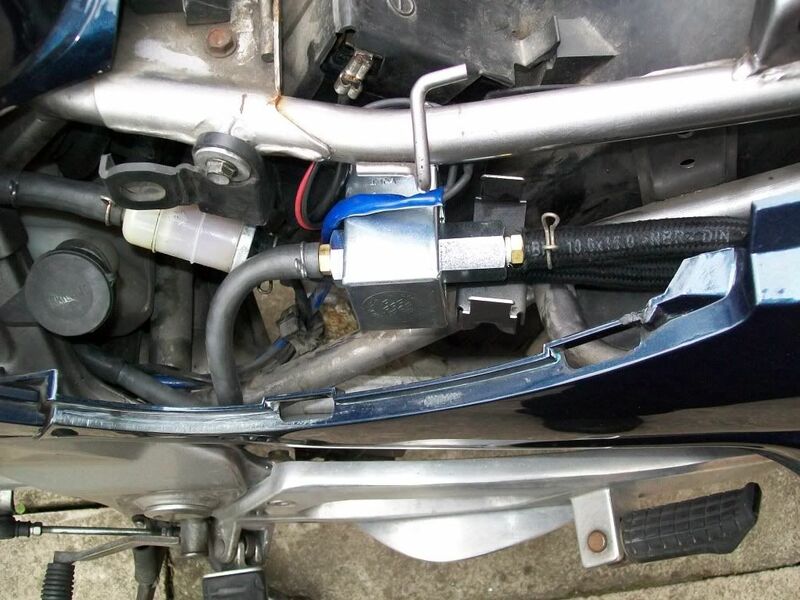 Facet fuel pump - unmounted ..&.. then mounted on his Deauville - a neat solution/installation. In order to mount the pump in the space available the original pump mount to the frame was hack-sawed/chiselled off. The battery box was drilled 8mm and the pump assembly attached.